1. Set up a pan with a steamer rack in bottom. Add 2 cups water and bring to a simmer. Place salmon on top of rack, cover and steam 8 minutes. Remove from pan and cool. 2. In a small saute pan over medium heat add butter, shallots and season with salt and pepper. Saute until softened about 3-4 minutes. But don’t let them brown. Remove from heat and set aside. 3.In a large bowl combine steamed salmon, crème fraiche, sauted shallots, lemon juice and zest, chives and smoked salmon lox. Season with salt and pepper. Stir until you get a smooth, spreadable consistency. Refrigerate 30 minutes. 4. Transfer salmon mixture to ramekins leaving half an inch of space at top. In a small sauce pan over medium heat heat clarified butter until melted. Pour half inch layer of clarified butter over each ramekin and refrigerate one hour. To serve remove and discard the butter seal. Place ramekin on serving plate along with a small bowl of The Goodies and crackers. 1.In a small mixing bowl combine all ingredients and mix well. 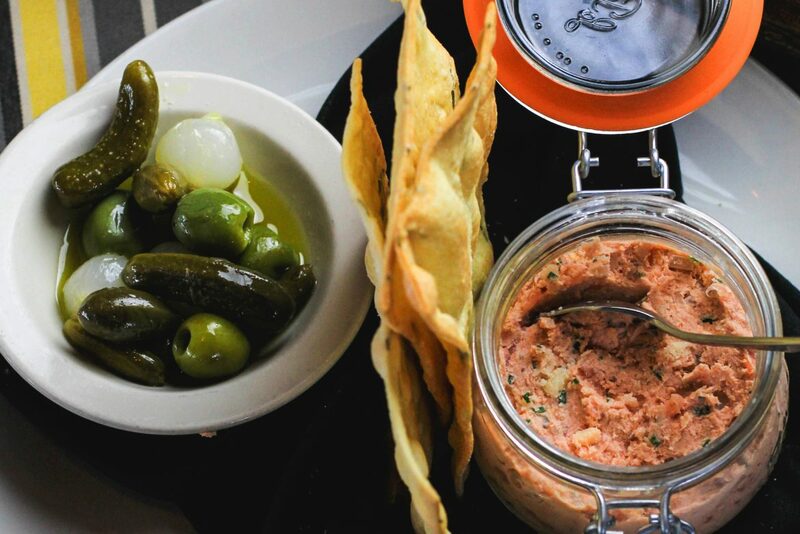 Serve alongside Salmon Rillette.